I am fully enjoying being on spring break! Yesterday I met up with two of my favorite teachers who I taught with last year! I love getting together with them because they always provide me with so many ideas and lots of inspiration! We had been doing book club meetings to talk about the Daily 5 and how we can implement it in our classrooms. Since we had finished that book, we were ready for our next one and Donna had the perfect book! I just started to read the book, but I am already so excited by what I’ve read! She talks about how everyone uses the words “number sense” without really knowing what it means and the understanding that goes along with it. The book has lots of diagrams, student examples, and actual stories about working with students during her research. It is fabulous! And although the book is targeted towards K-3 teachers, I teach 4th and am finding this book very beneficial. I am excited to use some of the routines and strategies she discusses in this book to work with my students! Also, have you heard of Singapore Math? 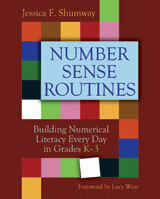 It is focused on developing students’ number sense as well. There are several Singapore math classes that my friends have recommended that I am planning to take when I am done with my Character Ed and Masters classes this summer! They are offered through Staff Development for Educators and I have heard nothing but good things about the courses! The 3 Teacher Chicks also have some great resources for Singapore Math! Whereas I am just beginning to learn about it, they seem like experts! Check them out if you want to learn more about the program! Hi Molly! Thanks for sharing this book. I have added it to my books to read this summer. We just adopted Singapore Math.. I'll have to check out the blog you mentioned! Have you ever used rekenreks? They are kind of like mini abacuses and they are expensive, but so good for number sense! I have also found an online one (and an app for one), and homemade cheaper ones on Pinterest! My last school used Math in Focus, which is based in some ways off of Singapore Math. I liked a lot of things they did, especially the problem solving with bar models! Hey Molly!! Thanks for stopping by my blog! You're blog is SO CUTE (and I'm definitely biased since pink is my favorite color:)) I'm your newest follower, and I can't wait to sit down and browse through it all. Thanks so much for talking about us! We are so happy that you find our blog helpful! We love yours!